For the past few years at Thanksgiving, Pallimed donates a blog post to Engage With Grace, a movement to encourage a new tradition of using the family time during this American fall tradition to get families talking about what is important to them. This is a movement you can easily get behind in person if you are an advocate for good patient centered health care, which you likely are if you are reading this blog. So donate your blog, Facebook update, Twitter account (#EWG) to Engage With Grace this holiday weekend. And then put your money where your mouth is and bring it up yourself while your family is together. To learn more please go to www.engagewithgrace.org. This post was developed by Alexandra Drane and the Engage With Grace team. 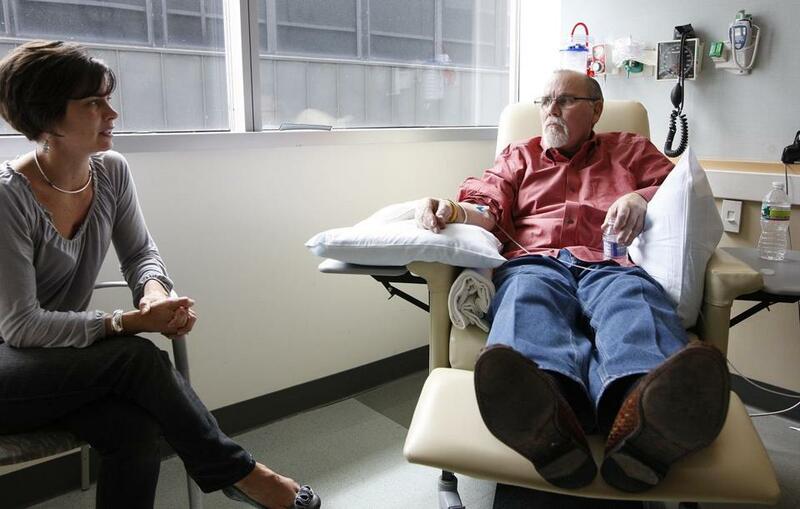 Paul White, shown here at a chemotherapy session with his daughter Laurie Alexander. In a July 24th article, A Better Kind of Care, The Boston Globe journalist Kathleen Burge introduced readers to Paul White, a successful owner of an engineering and manufacturing business, a man with a wife, two adult daughters, five granddaughters, and stage IV renal cell carcinoma. He had beat the odds repeatedly, having survived over seven years since the discovery of metastases. Despite availing himself of surgery, every new advancement in chemotherapy and participating in a clinical trial, his cancer was implacably progressing. Contemplating starting on what might be the last chemotherapeutic agent, he had also started seeing Dr. Vicki Jackson, Director of the Palliative Care Unit at Massachusetts General Hospital. IMHO, the article did a terrific job of fleshing out the concerns, dilemmas, and ambivalence of patients, family members and healthcare providers in the uncertain, lurching and insidious territory of life-limiting/life-threatening illness and its treatments. It also did a great job of featuring and explaining palliative care, and its role upstream from hospice care. Here are the published letters to the editor on the story. This morning I read in the Globe that Mr. White died on November 5th. We have posted here before at the passing of patients with variously documented life-limiting/life-threatening illnesses, e.g., here, here and here. I thought I would respectfully post this retrospective with gratitude to the many patients who allow us to glimpse some of the most difficult situations in hopes of connecting to, and of helping, others. "I Am a Doctor Working in Palliative Care. Ask Me Anything." The social news website Reddit advertises itself as the "Front Page of the Internet." The site might as well be called "Procrastination Grand Central" (based on my experience). For those unfamiliar with the site, Reddit relies on a simple upvote/downvote system which brings popular stories/posts to the top of the page. Once you click on a post, you will notice many comments which are once again ordered based on popularity. One can also search the site based on keywords. A lot of the stuff posted on the site is, well, junk... but there is enough good stuff to keep you occupied if you aren't not careful. One of the "subreddits" on the site is entitled "IAMA," which doubles for "I am a" and "ask me anything." Several posts strike me as notable. For instance, see "IAmA terminally ill man with ALS, AMA" or "IAMA 20 something that supports his two disabled/terminally ill parents about to deal with his 2nd eviction. AMA." The "subreddit" has a verification system which doesn't seem to be applied to every post. Veracity issues aside, it's curious to watch public interactions among (mostly anonymous) people attempting to grapple with these issues. "How do you deal with existentialist distress in your patients?" "What's your coping mechanism to deal with the amount of pain and death you see? Are the ones who get cured enough, or do you have another strategy? Are you religious?" "Are you afraid of dying? do you worry about getting a terminal illness and does that impact upon your life? what's your understanding of death? thanks a million." "I was diagnosed with stage 4 lung cancer about four months ago.......My question is when should I be looking at palliative care, if at all? What would it do to help me?" Several people didn't ask questions but merely thanked the physician for his or her work. Furthermore, the physician's response to the last question listed above (when should I be looking at palliative care, if at all?) leaves much to be desired. The response starts out appropriately: "I think the best person to determine when you should be considering palliative care would be your main treating physician" but then unravels very quickly when the physician suggests that being "minimally responsive" to treatment would prompt consideration of a palliative care referral. We know by now that earlier palliative care consultation for this patient may be appropriate. I'd be interested in the Australian perspective on the NEJM study to help us understand if system differences change the relevance of the study. Predictably, the poster with Stage IV lung cancer responds to the physician's comments, "Thank you for your response! Knowing when to seek out palliative care certainly helps! I hate to say it, but I'm going to do my best to never have to meet you in a professional setting!" I've written an additional response to the question. If you have comments you wish to make, it takes about 10 seconds to sign up for an anonymous account (no email address required). What do you think of this use of social media? Should the hospice palliative care community actively monitor sites like this for opportunities to educate? The FDA has opened a comment period, closing December 7, on it's just-released draft "Blueprint for Prescriber Continuing Education Program." The accompanying request-for-comment states that "The central component of the Opioid REMS program is an education program for prescribers and patients." If you've missed the previous discussion of opioid REMS, see Drew's blogs here and here and especially Stew Leavitt's extensive analysis last April. The actual REMS stuff that has come out so far has not been as draconian as some had fear ed when first announced. The education Blueprint is pretty benign and pretty much (what should be) standard of care for almost any medication: the prescriber should know about the medications' potential negative effects, take them into consideration in prescribing and in teaching/counseling patients, and systematically monitor effects. Naturally, there is a fair amount about managing the risk of intentional misuse. The content outline provided by FDA to educational providers states that education must include information on: (1) weighing the risks & benefits of opioid therapy; (2) choosing patients appropriately; (3) managing and monitoring patients; (4) counseling patients on the safe use of these drugs; (5) information on how to recognize evidence of or the potential for opioid misuse, abuse, and addiction. There are explicit statements that the educational basics outlined in the Blueprint do not have to be part of required education for licensing of prescribers, although apparently the FDA will approve these basic educational offerings. They estimate the basics can be presented in 2-3 hours. The industry consortioum has submitted suggested supplemental content that could take 10x that amount of time or more. FDA explictly says they will not require nor review supplemental educational content. The other explicit exclusion is Patient-Provider Agreements (these have been called opioid contracts in the past). FDA says content about these as a managment option should be included, but will not be required as a standard for pain practice. Industry is expected to provide grants to CE providers to develop and present these courses free of charge to prescribers. ACCME standards are to be maintained. My main concern, both viscerally and cognitively, is the generally negative tone. All the emphasis is on negative effects/risks with nothing at all said about how valuable and effective opioids are when prescribed and used as intended. There are statistics presented about the misuse, abuse, and non-medical use of opioids, but nothing at all about the prevalence of pain, as described in (competing?) government publications such as the "Special Feature: Pain" chapter in the CDC report Health, United States, 2006 and the IOM 2011 report Relieving Pain in America. See Stew Leavitt's discussion on the use/misuse of statistics in government publications on the prescription drug abuse "epidemic." The Blueprint is really not about managing pain--it's about prescribing and monitoring opioid analgesics. The target audience is probably primary care practitioners, but there are plenty of specialists who use opioids poorly, if at all. An educational emphasis on safe prescribing of these agents is probably not a bad thing, although the tone could reinforce the prevalent perspective that these medications are too dangerous to prescribe. I started to blog about two new reports from the Institute of Medicine (IOM). Both relate to patient-centered care, a major area of interest for the IOM in the past decade. But then I got distracted by some headlines that seem somehow related: The first was a New York Times piece, "The Downside of Doctors Who Feel Your Pain." The article, written by a young physician who considers herself to be empathetic and likable, wonders aloud if the current emphasis on improving the doctor-patient relationship is just a fad. Furthermore, she wonders if the adage her father introduced to her, "competence is inversely proportional to how much patients like" the physician, might have some truth to it. Appropriately, she questions how one measures the impact of improved interpersonal skills in overall healthcare quality and cost. Of course, palliative care was a little ahead of the curve in emphasizing interpersonal skills. Billings & Block at Harvard; Tulsky's pioneering research; Back, Arnold, Tulsky & company's Oncotalk training; ELNEC and EPEC (and EPEC-O); and family meeting as a bedrock "procedure" of palliative care are all examples. "The Virtual Nurse Will See You Now" and "Friending Your Doctor Online" are recent offerings in the online newspaper, Technology Review. I was surprised to read that patients found the virtual nurse, "Elizabeth," a computer simulation, was likeable and effective. Patients are reported to resonate with the empathic responses of Elizabeth and to respond well to her instructions and coaching. [I wonder how well she would get along with Siri?] A physician-prescribed social network designed by a startup called Wellaho is in clinical trials in San Diego. It differs from other health-related social networks by including clinicians and by being integrated with the electronic health record. Might this improve coordination across disciples and care sites? Could it reduce hospital readmissions through improved monitoring and communication? Back to the IOM: Patient-Clinician Communication: Basic Principles and Expectations is the inaugural IOM Discussion Paper, a new IOM series. Patient-Centered Cancer Treatment Planning: Improving the Quality of Oncology Care is the report of a workshop (Feb 28 – Mar 1, 2011) jointly sponsored by the National Coalition for Cancer Survivorship and IOM. Both of these publications grew out of the IOM emphasis on patient-centered care that was highlighted in the 2001 consensus report, Crossing the Quality Chasm: A New Health System for the 21st Century. In that report patient-centeredness was identified as one of six key characteristics of quality care. Patients are the “ultimate stakeholders” in an increasingly complex delivery system, often with poor coordination and unclear roles. “The effectiveness of patient-clinician communication can be as important as that of a diagnostic or treatment tool.” Basic principles of patient-clinician communication are enumerated: mutual respect, harmonized goals, a supportive environment, appropriate decision partners, the right information, transparency and full disclosure, and continuous learning. In cancer care the last point might be illustrated by the follow-up/reassessment visit before the next in a series of treatments, the transition visit between treatment modalities or at the end of treatment, or the reassessment following a family meeting or after introducing a treatment for a bothersome symptom. "Patient-Clinician Communication" is short, pretty straightforward, and appropriate for use in an introductory education offering in improving communication skills. It is, after all, a discussion paper, and is likely to spark substantive discussion in classroom and workshop settings. Applying these principles to cancer treatment planning is a challenge. 80% of cancer patients are treated in the community where fragmentation of services is inherent, but even academic medical centers are subject to communication hurdles (I know many of your are astounded to read that). The average cancer patient sees three specialists who may each be in a different location and has multiple treatments across time and space. Imaging and blood tests might also be in different locations. Each setting and even different departments within an institution may have documentation systems that don’t link with each other. Tumor Boards, designed to improve multidisciplinary care, may not insert their conclusions into the patient record and don’t include the patient in the discussion of treatment recommendations. Meanwhile, patients may access information from friends or the Internet that adds further complexity and confusion, despite the availability of high-quality Web sites. Many patients lose touch with their primary care practitioner during the acute treatment phase. The major recommendations of the conference were that a shared decision-making model be used and that each patient be given a written treatment plan. Shared decision-making includes an active partnership between patient and physician in which shared treatment goals are agreed, risks and benefits of various alternatives are discussed, and the values and preferences of each are honored. A written treatment plan includes collaborative input from each discipline and specialty involved, incorporates patient preferences, and identifies the responsible clinician(s) for each phase of care. The treatment plan is organic and may need to be revised as the patient progresses through treatment. The treatment plan then becomes the basis for the treatment summary and survivorship care plan, documents advocated by a previous influential IOM report, From Cancer Patient to Cancer Survivor: Lost in Transition. A good summary of the treatment planning publication can be found in the Oct 10 issue of Oncology Times. The cancer treatment planning conference did not limit itself to the acute treatment phase of care. It also covered advance care planning, survivorship planning, and planning care for advanced disease. Despite the splash made by Jennifer Temel's early palliative care study in late 2010, it was mentioned only once in this report, in the context of advanced care planning. Discussants included Tom Smith, Betty Ferrell, and others well-known to the palliative care community. The cancer-planning document is not a peer-reviewed report, like "From Cancer Patient to Cancer Survivor." None-the-less, it is meaty and the discussants are all well-known and influential. I suspect (and hope) that it will become the basis for numerous discussions around the country about improving the process of treatment planning at all phases of cancer care. [IOM products are available for purchase in hard copy, can be viewed free on the IOM web site, and many, including those mentioned here, can be downloaded in free in PDF format]. A 50 -year-old woman calls the palliative care office requesting an outpatient evaluation. She says that she was diagnosed with rheumatoid arthritis approximately one year ago. She has gained benefit from initiation of disease modifying anti-rheumatic drugs yet she is still left with residual pain that has caused her to cut back on her work schedule. She reports over the phone that she has stopped going to church because she has a hard time sitting through long early morning church services and she's also developed depression. She read about palliative care on a website and decided to give the clinic a call to request an evaluation. Is this a scenario which you have been encountered previously ? I ran across a blog post the other day ("Palliative Care: The Pal for Every RA Patient") from an enthusiastic advocate for patients with rhematoid arthritis who suggested that palliative care might have a role in this type of patient. Does the patient have a serious illness? No one can argue the fact that rheumatoid arthritis is very serious. Does the patient have a burden of symptoms? It certainly seems so. Check. Does the patient had significant psychosocial and spiritual concerns? Yes indeed. I think it is flattering that palliative care would be considered an option in this type of scenario. It means that our field's message is truly getting across to a wider audience and that our philosophy is resonating with that audience. The biopsychosocial model which underpins palliative care also applies very well to care of patients with rheumatoid arthritis. If an expert palliative care inter-disciplinary team is to see patients as described above, though, we are going to need to bring our sleeping bags into work. The recent CAPC Public Opinion Survey suggested that we should say that we see patients who have "serious" illness rather than "advanced," "life-limiting," or "terminal" diseases (see Christian's post about the survey here). I have found this to be helpful as I describe our services to new patients/families. If we want to see patients at an appropriate point in their illness course, create appropriate demand amongst patients/families, and ensure they will embrace us from the start, then using "serious illness" does seem to be a more sensitive approach (for finding cases which may be appropriate for palliative care). We'll likely never find an ideal 1-2 word adjective to describe the type of patients we think we can benefit most. Most of the terms above represent general statements regarding prognosis but still leave a lot for interpretation (eg when in the does one become "terminally ill"?) "Serious" tells you even less regarding prognosis- it's only a vague conception of how a patient or family perceives their illness. We need to accept that while "serious illness" is more sensitive than other terms , it probably isn't as specific. As we try to maximize the number of appropriate early referrals, we'll continue to be challenged to determine what our role is for patients as described above. Intersections between palliative care and rheumatology do definitely exist, though. The author of the blog post does refer to a journal article which describes some cases where palliative care is most certainly appropriate. This article is worth a glance and I have encountered some similar issues in my clinical work. Certainly I do not discourage this type of advocacy. I remember from my residency being exposed to several rheumatologists who practiced medicine using a biopsychosocial philosophy. I'm sure that many of them would welcome greater interdisciplinary involvement. Perhaps palliative care's greatest benefit for these patients would be more indirect than seeing every patient. System-wide educational and quality improvement palliative care initiatives may be where the value is for these patients. I would schedule the patient for an appointment with a plan to provide a single evaluation, sending recommendations back to the rheumatologist and primary care physician. I would be open to the possibility of comanaging this patient over time alongside the patients rheumatologist and primary care physician. I would consider taking over this patient's primary care as the palliative care clinician. I would not schedule an evaluation of the patient. Outpatient palliative care clinic? We're barely keeping our heads above water seeing patients in the hospital!